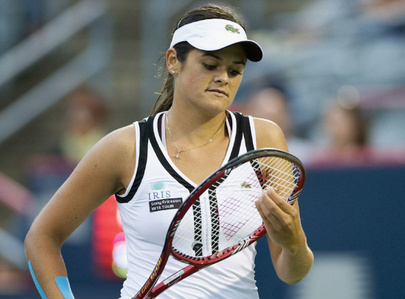 Canada’s home-grown players exit 2010 Rogers Cup. The Rogers Cup has lost its top-ranked Canadian as local favourite Aleksandra Wozniak of Blainville, Que., fell in straight sets 6-3, 6-2 to Timea Bacsinszky of Switzerland in front of a strong centre-court crowd at Uniprix Stadium on Monday night. It was the first time Wozniak, ranked 53rd in the world, had faced the 49th ranked Bacsinszky in her career. Bacsinszky’s serve was extremely erratic with a first serve percentage of only 39 per cent, but Wozniak was unable to take advantage and ultimately fell in the first round of her home tournament for a second straight year. Wozniak began the match well with three service winners and an ace in the opening game, but her game began to go downhill when Bacsinszky broke her serve to go ahead 2-1 in the first set. Wozniak wasted a break point opportunity in the subsequent game and then double faulted twice to hand Bacsinszky another break for a 4-1 lead. It was the same pattern in the second set as Bacsinszky got a break to go ahead 3-1 and never looked back, winning in straight sets in a swift 64 minutes. It was only Wozniak’s second tournament since losing to Jelena Jankovic in the second round at Wimbledon in June as she has battled tendinitis in her right forearm. There was some question as to whether Wozniak would be able to play in Montreal, and she was wearing tape on the damaged forearm during Monday evening’s match. The tournament also lost all of its Canadian content in the doubles portion on day one. Marie-Eve Pelletier of Repentigny, Que., and Toronto’s Sharon Fichman fell 6-3, 7-5 to the team of Daniela Hantuchova and Caroline Wozniacki. Heidi El Tabakh of Oakville, Ont., and Vancouver’s Rebecca Marino also dropped their first round match 6-2, 6-1 to the sixth-seeded team of Yung-Jan Chan and Jie Zheng. Last year’s finalists on track for a repeat performance. Caroline W ozniacki eased into the quarter-finals of the MPS Group Championships with a straight sets victory over Sofia Arvidsson at Ponte Vedra Beach. The 19-year-old Dane defeated her Swedish opponent 6-3 6-1 at the Florida venue to make sure of her place in the last eight of the event. Elsewhere, Canada’s Aleksandra Wozniak reached the quarter-finals with a win over Japan’s Ayumi Morita. Wozniak, runner-up last year, hit back from the disappointment of dropping the first set to earn a 2-6 6-3 6-2 victory and set up a meeting with Slovakia’s Dominika Cibulkova, who beat Russia’s Alla Kudryavtseva 6-3 6-3. Fifth-seed Anastasia Pavlyuchenkova converted her sixth match point to see off America’s Bethanie Mattek-Sands 6-7 (4/7) 6-4, 6-2. Canada defats Cuba in Fed Cup qualifyer. Aleksandra Wozniak led Canada to a 3-0 win over Cuba on Wednesday in its first match in qualification for the Federation Cup women’s tennis championship. Wozniak, a Blainville, Que., native ranked 34th in the world, became the winningest Canadian player in Fed Cup history with 30 victories, after defeating Yamile Fors-Guerra 6-3, 6-3 in singles, then teaming with Marie-Eve Pelletier of Repentigny, Que., to beat Fors-Guerra and Lumay Diaz Hernandez 6-1, 6-0 in doubles. The wins put Canada in first place in the Americas Zone Group A standings. Sharon Fichman of Toronto notched Canada’s other win a 6-2, 6-1 singles victory over Misleydis Diaz-Gonzalez. With the two wins, Wozniak passed Sonya Jeyaseelan of New Westminster, B.C., as Canada’s most successful Fed Cup player. Canada plays its next match on Thursday against Puerto Rico, then wraps up round-robin play Friday against Brazil. The Group A and Group B winners will then play to see who advances to the tournament’s World Group II qualifying round in April 2010. The two lowest ranking teams will be sent to Group II of the Americas Zone in 2011. Aleksandra Wozniack named Canadian Athlete of the Year! Aleksa ndra Wozniak knocked off the reigning French Open champion, beat three other top-15 tennis players and sent a former world No. 1 packing in her swan-song tournament. Still, for Wozniak the achievements weren’t good enough – what 2009 gave her, more than anything, was a hunger to accomplish more. “One day, I really want a Grand Slam – that’s going to be a dream come true,” she said. She wasted little time bouncing back, reaching the final at Ponte Vedra Beach, Fla., in April – defeating a top-10 player in Russia’s Nadia Petrova along the way. “My whole family, they keep supporting me – even when things are not going well, they’re always there,” Wozniak said. Wozniacki is thru to the semis in Japan. Top seed Caroline Wozniacki was made to work hard by Canada’s Aleksandra Wozniak before securing her place in the semi-finals of the Japan Women’s Open with a 6-2 6-7 (1/7) 6-2 win. The Dane appeared to be on her way to another comfortable win when she took the first set, but her near-namesake fought back taking a tense second by storming through the tie-breaker. But Wozniacki upped her game in the final set, finding rhythm on serve and breaking twice to finish the match off with relative ease. Next up for Wozniacki is third-seeded Australian Samantha Stosur, who had an easier day with a 6-1 6-3 win over Jill Craybas of the United States. The other semi-final will see India’s Samia Mirza face Italian fourth seed Francesca Schiavone after both players advanced courtesy of injuries to their quarter-final opponents. Unseeded Mirza was 6-4 2-0 up against second seed Marion Bartoli when the Frenchwoman had to withdraw with a shoulder injury, while Schiavone was handed a walkover with Melinda Czink unable to take the court because of a foot problem. Pavlyuchenkova will try to ‘knock-off’ Kuznetsova next. Qualifier Anastasia Pavlyuchenkova, ranked No. 39 in the world, continued her run Wednesday afternoon by defeating world No. 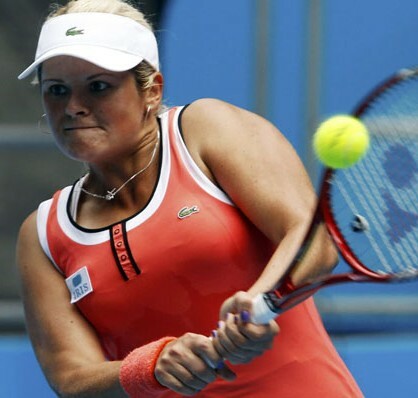 35 Aleksandra Wozniak to advance to the quarterfinals of the 2009 China Open. The 18-year-old, who upset No. 3 seed Venus Williams on Monday, defeated Wozniak in two sets, 6-4, 6-4. She played almost flawlessly, committing just one double fault and serving four aces. Wozniak had a rough start to the match, winning only one point in the first three games of the first set. She came back to break Pavlyuchenkova twice, going up 4-3, but it wasn’t enough to match Pavlyuchenkova’s three breaks and two aces in the first set. In the second set, Wozniak again struggled from the start, as Pavlyuchenkova broke her in two of her three first service games, quickly going up 5-1. Wozniak made a final run at Pavlyuchenkova, winning three games in a row, leaving her trailing 5-4. It was too little too late, as Pavlyuchenkova won her next service game, matching her first set score of 6-4. In the quarterfinals, Pavlyuchenkova will meet fellow Russian Svetlana Kuznetsova. ‘Hot’ Pennetta a cinch for the final eight? The in-form Flavia Pennetta was the first winner on day five of the US Open in New York. The 27-year-old, who won the recent warm-up tournament in Los Angeles, part of 15-match winning streak, sauntered to a 6-1 6-1 victory over Canada’s Aleksandra Wozniak in less than an hour. Wozniak did not hold serve in the entire match. Indeed she won just 26 per cent of the points on her own delivery. That meant Pennetta did not even have to play that well to progress – her first-serve percentage was a lowly 34 per cent. Pennetta’s good form has seen her become the first-ever Italian to crack the world’s top 10 and she’s now just one win away from equalling her best-ever run at a Grand Slam. That came at Flushing Meadows last season when she made the quarter-finals. Pennetta will now face either Vera Zvonareva or Elena Vesnina for a place in this year’s last eight. Former world No1 Amelie Mauresmo crashed out of the US Open to Aleksandra Wozniak in straight sets. The 21-year-old Canadian took a closely-fought first set 6-4 but the Frenchwoman collapsed in a dismal second set. She piled up the unforced errors and lost all three service games en route to a 6-0 thrashing. It was a painful end for Mauresmo who won two Grand Slams only back in 2006. The 10th seed Flavia Pennetta scorched into the third round trouncing Sania Mirza 6-0, 6-0. The Italian 27-year-old needed just 50 minutes to end the challenge of the Indian.